Having recently discovered the amazing Khan Academy courses online, I decided that my brain would benefit from some fresh art history exercise. Starting with the units on Gothic art I have worked my way up to the Neo Classical so far. Each subject is explored alongside the political and social contexts of where the style manifested, and when I came across a video for Peter Paul Rubens‘ Marie de’Medici cycle among the Baroque lessons, I knew I had found my next POTM. All 24 of the ‘episodes’ from Marie’s life depict her as a heroine, emerging through her trials and tribulations to fulfil her destiny as Queen of France. Although the series was commissioned for private display, there is a sense that she wanted to impress something upon anyone who saw the paintings, and she wisely chose Rubens as the man for the job. The Disembarkation at Marseilles (1622-1625) shows Marie de’Medici landing in France, having sailed from her hometown of Florence. 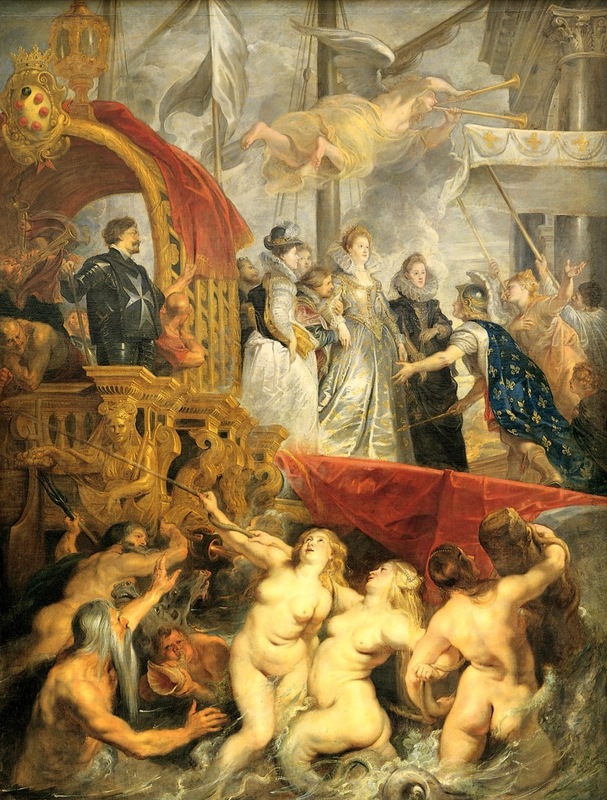 Rubens usess the Baroque style to highlight the glory and grandeur of the her landing. The painting is a cacophony of colour and movement; red and gold dominate the canvas, every figure is moving and trumpets add an element of ceremonious sound. The numerous bodies in the picture – from well-dressed nobles to mythical sea creatures – gesticulate and writhe in Marie’s direction, but she remains still and composed. As she emerges from her gilt ship surrounded by her entourage, she is literally welcomed to France with open arms. Elegantly dressed in a gold-embellished white gown she is the very definition of regal. Among the non-human witnesses to the event is a winged angel, three sea nymphs, Poseidon (God of the Sea) and his son Triton, who have presumably safeguarded Marie’s journey to her new kingdom. The canvas is quite strongly divided by the opulent boat on the left and the classical architecture of Marseilles port on the right, which serves as a sort of stage set to the drama. The red-carpeted gangplank also divides the canvas horizontally, literally depicting Marie’s path to her future. As well as creating a sense of depth (albeit a stinted one) our eye can flow over the canvas, but is always lead back to Marie, standing statuesquely amid the chaos her announcement has induced. Rich colours and textures add to the extravagance of the momentous occasion, in particular the shimmery fabric of Marie’s dress. Rubens’ vision of Marie de’Medici’s arrival in France is energetic and sensational, and immortalises the rather ordinary event of a ship’s docking in a way only he could.